We have only completed two rounds of fixtures, but National Two South’s frontrunners Rams RFC and Henley Hawks will be aiming to put another win on the board when the local rivals meet this weekend. Both sides have picked up maximum points from their opening two games which adds an extra bit of spice to this derby clash at Old Bath Road. Alongside the early pacesetters, Redruth are also unbeaten going into Round Three and they travel to Worthing Raiders this Saturday. Also, in National Two South this weekend, Taunton Titans host Clifton, Barnes entertain Old Albanian and Bury St Edmunds welcome Guernsey to Suffolk. Elsewhere, Canterbury go to an Old Redcliffians’ side searching for their first victory of the term, newcomers Dings Crusaders and Birmingham & Solihull clash in Bristol while London Irish Wild Geese go to Tonbridge Juddians. Both Rams RFC and Henley Hawks are the only two sides to have picked up successive bonus-point wins to begin the season and they clash this weekend in a local derby at Old Bath Road. The hosts have kicked off the new campaign in style having scored over 40 points in both of their victories over Canterbury and London Irish Wild Geese. Head coach Seb Reynolds told us this week that the Rams are all about ‘constant improvements’ and after finishing in their highest ever position of third place last term, it seems like they are continuing their forward momentum. However, Henley will be out to stop them in their tracks in Round Three after also making an excellent start to the new season. Back to back wins against Bury St Edmunds and Barnes has given the Hawks a great platform to work from and they will be hoping to make it three wins on the spin when they take the 20-minute trip down to Berkshire. Redruth made it back to back wins in Round Two after seeing off Taunton Titans in a thrilling encounter at the Recreation Ground. Head coach Pale Nonu was pleased to see his side get over the line against Taunton and he now wants the improvements within his team to continue when they travel to Worthing Raiders this Saturday. The Reds have the capabilities to challenge for a top two spot this season so Worthing will be aware of Redruth’s threat in Round Three. In terms of the Raiders, they bounced back from a humbling opening day defeat at Taunton to clinch their maiden victory of the campaign against Guernsey last weekend. Worthing are now back at Roundstone Lane for their first home fixture of the season so they will be looking for success in front of their own supporters. Taunton Titans managed to claim two bonus-points from their defeat against Redruth last weekend, but they may well have been frustrated by their performance. It was only in the last 10 minutes when Tony Yapp’s side started to show their quality so they will be keen for a more complete display when they host Clifton this Friday. The Titans may be harbouring promotion hopes after flirting with the top two for the last few years, but consistency will be key to that. The word ‘consistency’ is something Clifton may crave as well. After fending off relegation for the last couple years due to a lack of positive results, the Lavender and Blacks begun this term with a derby win over Old Redcliffians. However, they suffered an immediate setback when they were beaten at home by newly promoted Dings Crusaders so Matt Salter will be wanting a reaction from his side in Somerset this Friday evening. Despite losing to Henley Hawks last weekend, Barnes can be pleased by the performances they have produced in their opening two fixtures since promotion from London and SE Premier. 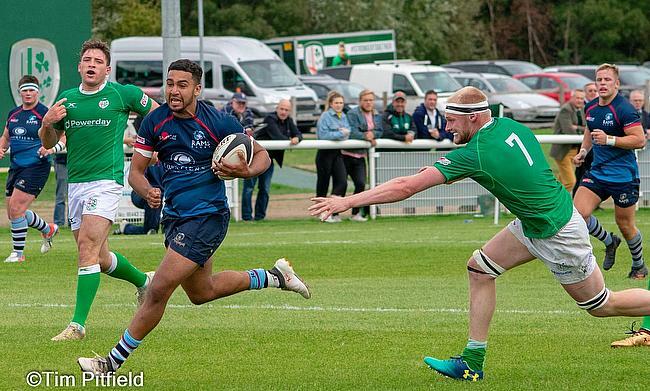 Joe Gray’s men beat London Irish Wild Geese at home in Round One and the newcomers to National Two South will be aiming for another triumph on their own patch when they host Old Albanian. Barnes have won 12 of their last 14 matches at Queen Elizabeth Walk and they welcome and OAs side fired up for a reaction. Gavin Hogg watched on as his side suffered a defeat against his old club Bury St Edmunds in Round Two and after relegation from National One in April, this may well have been a minor dent in their promotion plans. The last time OAs travelled to Barnes was in April 2016 when they triumphed 47-26 so the Hertfordshire club will be looking for a similar result this time around. After shipping 45 points on the opening weekend against Henley Hawks, Bury St Edmunds responded in the perfect manner as they beat promotion contenders Old Albanian last Saturday. Jon Curry’s side had the clinical edge to secure their first win of the new campaign and they will be firm favourites to double their tally when Guernsey visit Suffolk in Round Three. ?? Here is the the #Wolfpack team named by Jon Curry to host @GuernseyRFC in round 3 of @nca_rugby #Nat2S at the @GreeneKingIPA Haberden. Following a thumping from Old Albanian in Round One, Guernsey showed improvements last weekend against Worthing Raiders and the newly promoted side will now be keen to continue moving in the right direction this Saturday. Captain Lewis Hillier said at the start of the campaign Guernsey can impress on the road this season because they are used traveling, so he and his side will be hoping their first ever win in National Two South is just around the corner. Following a very disappointing performance in Round One against Rams RFC, Canterbury bounced back in the second week of the season as they earnt the bragging rights in Kent following a 29-20 win over Tonbridge Juddians. Andy Pratt would have been pleased to see his side put their opening day defeat to one side and now they are up and running heading into this weekend. The City Men will be aiming for successive wins for the first time since December when they travel to an Old Redcliffians side desperate for a victory. The men from Scotland Lane avoided the drop in 2017/18, but defeats against last season’s relegation rivals Clifton and newly promoted Birmingham and Solihull is not the start Saul Nelson and his side were looking for. A victory on their own turf this weekend would be a much-needed confidence booster for the Bristol club. Despite suffering a defeat, Dings Crusaders produced a positive display against Redruth on the opening weekend of the season and Luke Arscott’s side were able to build on that performance in Round Two. The Crusaders travelled to local rivals Clifton and thanks to the boot of Ben Bolster, they secured their first win back in National Two South. Dings will now be keen to seal their maiden home victory of the season when they face fellow newly promoted side Birmingham and Solihull this weekend. Like their hosts, the Bees also opened their National Two South account in Round Two with a victory over Old Redcliffians which moved Pete Glackin’s side into ‘positive’ points after beginning the campaign on -5 points. After encouraging displays against Tonbridge Juddians and the aforementioned Old Reds, the Midlands club will be hoping for a successful trip to the West Country this weekend. After seeing off the challenge of Birmingham and Solihull in Round One, Tonbridge Juddians fell to a derby day defeat against Canterbury last weekend. On the club’s website, it stated TJs ‘lacked a spark’ at the Marine Travel Ground so they will be hoping their season can burst back into life when they welcome London Irish Wild Geese to the Slade on Saturday. We are still in the embryonic stage of the campaign, but once again, London Irish Wild Geese are struggling towards the wrong end of the table. The men from Hazelwood were well beaten by Rams RFC last weekend, after losing to Barnes on the opening day, so Lee Starling’s side will be keen to pick up their maiden win of the season sooner rather than later otherwise the Wild Geese could find themselves embroiled in yet another scrap for safety further down the line.